I will admit right off the bat that I was not familiar with Julian Hawthorne before reading this book. His famous father, Nathaniel Hawthorne, of course is required reading somewhere along the way for any English major. So why read this biography of a famous author’s son? It turns out that Julian was also an author … and a bit of a cad. This was a well researched and put-together biography of a ‘lesser’ literary figure. It’s not unusual for children with famous parents to have a difficult time succeeding, especially if trying to follow in their parents’ footsteps. Julian Hawthorne is a classic example of this. Living, somewhat, in the lap of luxury, thanks to his father’s works, Julian grew up lacking the ambition to succeed, but with the expectation that success would come to him simply because he was Julian Hawthorne. Rubbing shoulders with giants in the literary field as he matured (Thoreau, Emerson, Melville, Alcott) he seemed to think that writing would come naturally and easily to him. He wasn’t necessarily wrong, but writing well, is another matter. Although he showed some promise in engineering, his lack of ambition, skill, and the matter of his father passing away while he was a teen had him falling back on a writing career to support his young bride and child. His works never achieved any sort of true success. On occasion he managed a good review, but for the most part, Julian might be considered one of America’s first ‘hacks’ — a writer who managed to output materials that were readable, but forgettable. In addition to his penny romance novels, Julian wrote essays and articles for newspapers, mainly Hearst’s papers, which leaned toward the sensational more than newsworthy. Again, based primarily on his up-bringing … seeing famous writers and how they lived, it was important for Julian to keep up appearances. Living in a home that was too much for the family, and maintaining servants, when all the time he struggled to make enough money to feed his family. he borrowed from friends until they stopped loaning him money. He borrowed against advances on his writing. He raised his writing rates, despite the fact that his works weren’t selling. He lived constantly in debt, and constantly working an angle to procure an income. But NEVER working a ‘job.’ He even took to selling off his father’s work to provide some income. Late in life, he teamed with some acquaintances and wrote ad copy for a mining stock. His payment for the work was a portion of the income. The stock was fraudulent. We are never quite sure whether Julian was fully aware of this or not, but he drew the short end of the straw and spent the most time in the Atlanta Federal Prison for his role in this mine stock fraud. It was a result of his time in prison that he perhaps achieved his most fame as a writer. Julian wrote a series of essays on the horrible conditions inside the Atlanta Federal Prison. From the food, to the crowding, to the punishment, he decried the penal system. His essays prompted a review of the prison by federal legislators and ultimately the dismissal of the warden. Julian was proclaimed a hero to those still incarcerated. Julian Hawthorne is an unusual, and unlikely subject for a biography. It’s not a particularly happy story, but it is an interesting one. If nothing else, it reminds us that when we don’t teach our children to reach beyond us, they never learn to do for themselves. Though, by all accounts a failure; at writing; at being a family man; at being a friend; at managing finances … Julian was, however, a survivor. A bit of a wolf and a cad, but tenacious. I’m still not entirely sure why he was chosen for the subject of a biography. I can’t honestly say I’m glad that I read this … I don’t think I was changed in any way, and certainly my impression of Julian Hawthorne wasn’t changed as I was never aware of him in the first place. Looking for a good book? If you enjoy biographies of little-known historical figures, this book is well researched and well written. 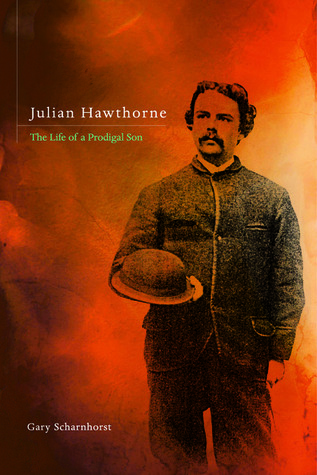 But as a subject for a biography … Julian Hawthorne leaves a lot to be desired.